The Quaternary sediments fill the depressions of the model. -Inverse Distance was selected as interpolation algorithm with additional options, including Decluster (Average), Smooth (2x2), Faulted (2D Fault). After successful running the interpolation, the Quaternary sediment extends over the whole region despite no Quaternary deposits are recorded in the boreholes. any suggestions to bypass this issue? In areas of no data, RockWorks uses the data from other areas to estimate what the top and base of a unit are when gridding. You can constrain the interpolation by specifying a maximum distance to allow the program to search for nearby data, or add points with the same top and base of the unit (zero thickness) where the unit is absent. Polygons and faults can also be used to constrain a unit. For display purposes, you can increase the Hide Thin Zone value to a larger value, such as 1.0m or ft.
You may want to grid the Quaternary separately, then add it to the model by changing the name to use the Stratigraphy model naming convention: <unit>_top.RwGrd, <unit>_base.RwGrd. I would try the second option which seems more reasonable (giving zero thicknesses). Unfortunately, polygon clipping option requires a lot of post-processing and time for smoothing grids. I think the most challenging issue in Rockworks is how to replicate complex stratigraphic succession. So it would be so appreciated when Rockware put Stratigraphic package on the subsequent development plan. I'll tell you about the results. Unfortunately, results of zero-thickness option didn't provide good results (almost no changes). I increased the cutoff to 1, 20% maximum interpolation distance. The interpolation continues trends for the Quaternary deposits! The depths measured from the elevation. I'm wondering if the difference between the borehole Z elevation and the DEM could cause such problem! By the way, how to snap them to the topographic surface? 20% may be too high a number for the maximum distance. Try 5% or 10%. You may want to try another gridding method. Triangulation will result in angular surfaces, but it is automatically truncated to the boundaries of the "convex hull" surrounding the data points. There is something unusual going on in the SE corner, where the Quaternary and Aquitanian (gray and yellow) stick out of the brown Paleogene. It may be that the upper units are not constrained by the underlying Paleogene because it is not interpolated in that corner. To change the borehole elevations to match a DEM, choose the Borehole Manager Edit | Adjust Elevations Based on Grid Model. Thanks for your support. In the southeastern corner, the yellow Neogene deposits pinched out of the Paleogene formation once I activate the maximum interpolation distance to 20%. However, I tired with 5 and 10%, but the result was a clustered small circles surrounding boreholes. I'll try to snap all boreholes to the surface grid elevation and see if it can solve the problem. I will send you a copy if it doesn't work. No changes after snapping wells to surface topography, I uploaded a backup of the project as requested (File name: Backup_Rudy.rar). I also enclosed the shape files represent the real Quaternary and Neogene boundaries. The top of the Quaternary is raised above the base by the option under Stratigraphic Modeling Options | Constraining Surface | Replace Top Surface with Ground Surface. The base of the Quaternary is not pulled up, resulting in a net thickness to this unit. 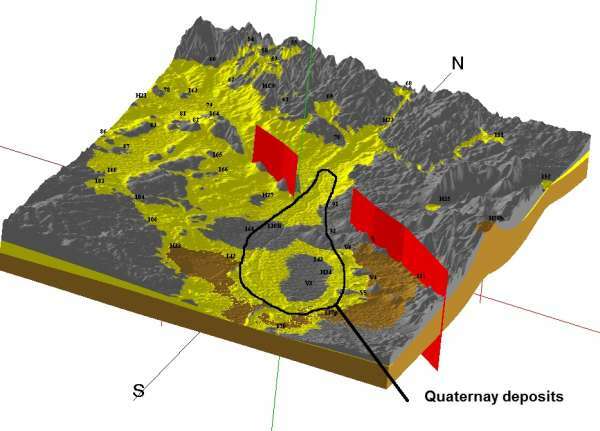 To make the model match the Quaternary SHP file, add points along the polygon or use polygon clipping. Many of the boreholes omit missing formations rather than including them at the proper depth with zero thickness, causing the model to be unconstrained for the missing formations in certain areas. The Top Down modeling order works well for all formations based on an west to east cross section. Create additional cross-sections to test this setting throughout the model. 1. Should I deactivate the option/ replace top suface with ground surface? 2. Do you construct the Quaternary top and bottom based on boreholes elevation? 3. Could you please provide me with the your modified version of the project for comparison purpose. please accept my sincere appreciation. 1. Deactivate the option to replace the top surface with the ground surface to prevent the Quaternary_Top from being pulled away from the base. 2. The elevations of the Quaternary top and base are based on the borehole elevation minus the depth to the top and base of the Quaternary. 3. There is a consulting charge of $150/hr to provide files, but support (without files) is included for free with your license. I finished the model yesterday and I pleased to share you the result I don't know why " There was a problem processing the uploaded file. Please contact us for assistance "
Actually, I based on the tools: Raster calculation, Polygon clip, and substitute surface (for the Neogene and Paleogene). I'm glad to hear you were able to create a model that you liked. thanks! I will try to improve it further, but why I cannot upload a screenshot here are there any size limitation for each topic? I don't know of any size limitations to image uploads. Send your screenshot to [email protected], and we'll pursue the issue further.